As a part of normal ageing, the skin of the eyelids may sag and become loose and baggy. Excess fatty tissue in the upper and lower eyelids may contribute to the condition. Some people find this unsightly. If the condition is extreme in the upper eyelid, it may partially block vision. Eyelid reduction plastic surgery, 'blepharoplasty', can correct both aesthetic and visual problems. The loose fold of skin that droops over the eyelid can be removed to make the eyes appear bigger and younger looking. The bags below the eyes can also be reduced. Eyelid reductions are one of the most common plastic surgery operations and can be undertaken in our theatre with a local anaesthetic. 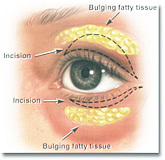 Murray Beagley is a specialist in Blepharoplasty eyelid surgery.